There hasn’t been a theatre review on A Mess In A Dress recently, mainly due to the fact that I haven’t, well, been to the theatre. It’s been an age! I’m suffering withdrawal symptoms! Luckily I’m making up for it with a string of shows through the summer and into autumn. First up is the UK tour of Funny Girl at the Theatre Royal in Nottingham. Funny Girl is one of those classic musicals that I know a little but I’m not 100% familiar with. I knew some of the more popular songs and the basics of the plot but not much else. Funny Girl tells the semi-autobiographical story of Fanny Brice, an upcoming Broadway star and her doomed relationship with her husband Nick Arnstein. Right from the opening moments of the show, I had a feeling that this was going to be something a little special. The proscenium arch was covered in lights, the orchestra was bold and brilliant and the overture helped set the tone. The set was relatively simple but very effective. I loved the use of mirrors and lights surrounding the stage – it reminded me of Art Deco architecture and added to the showbiz feel of the production. The music is obviously sensational, with all the big hits that we know and love. “People”, I’m The Greatest Star and (obviously) “Don’t Rain On My Parade were the ones I knew best, but there were some great numbers I hadn’t heard before such as “Sadie, Sadie”. Some shows are ensemble pieces where the performance feels evenly weighted. Other shows have a definite centre – one actor or actress who hold the whole production together and carry most the of the weight on their shoulders. It was certainly the latter in Funny Girl and Natasha J Barnes certainly showed no difficulty holding her own here. Her performance as Fanny Brice was simply a masterclass in acting and should be featured in the musical theatre dictionary under “star quality”. Barnes excelled at beautifully-timed comedy while the more serious moments were expertly handled. Across the board, her performance was completely natural and believable. With any character that has been made iconic by a performer such as Barbara Streisand it is so difficult to avoid comparisons and not seem like a poor copy, however Barnes managed to transform the character into something new and exciting. She owned that role from the moment she stepped on stage to her very last moment. By the end of the show I was hanging off of her every word and struggling to hold back the tears. I love a good standing ovation as much as the next person but I have seldom seen one more deserved. I’m certainly hoping to see and hear a lot more of Natasha J Barnes in the future. Although I’d be lying if I said Barnes wasn’t my main focus for the evening, I’d be doing the rest of the cast a massive disservice if I didn’t talk about their performances as well. Darius Campbell (yes, that Darius) played the debonair and charming Nick Arnstein, Fanny’s love interest and eventual husband. Darius seemed so perfect for the era of the show. He oozed charisma and had a great singing voice, especially in the song “Temporary Arrangement”. His “Nicky” seemed to have genuine affection for Fanny and even though I knew how it was all going to end, I was still rooting for them as a couple. The supporting cast were all brilliant. I loved the colourful mix of characters including Nigel Barber and Kit Benjamin as theatre producers Florenz Ziegfeld and Mr Keeney and Zoe Ann Bown and Myra Sands as Fanny’s nosy neighbours Mrs Meeker and Mrs Strakosh. Rachel Izen and Joshua Lay were particularly engaging as Fanny’s mother, Mrs Brice and her old friend Eddie respectively. Lay’s dancing was amazing, and Izen gave him a serious run for his money in their duet “Who Taught Her Everything She Knows”. The ensemble as a whole were a lively, talented bunch who helped to flesh out the world of Funny Girl. The choreography was fabulous and felt really fresh and detailed. The whole cast looked like they were really enjoying themselves which can’t be easy when they’re doing roughly 7 shows a week! Overall I thought Funny Girl was an absolutely stunning production with very little that I could pick fault with. I had thought that Les Cage Aux Folles would be the best thing I saw this year, but Funny Girl gave it some SERIOUS competition. Funny Girl is showing at the Theatre Royal, Nottingham until Saturday 17th June and then continuing it’s tour around the UK. 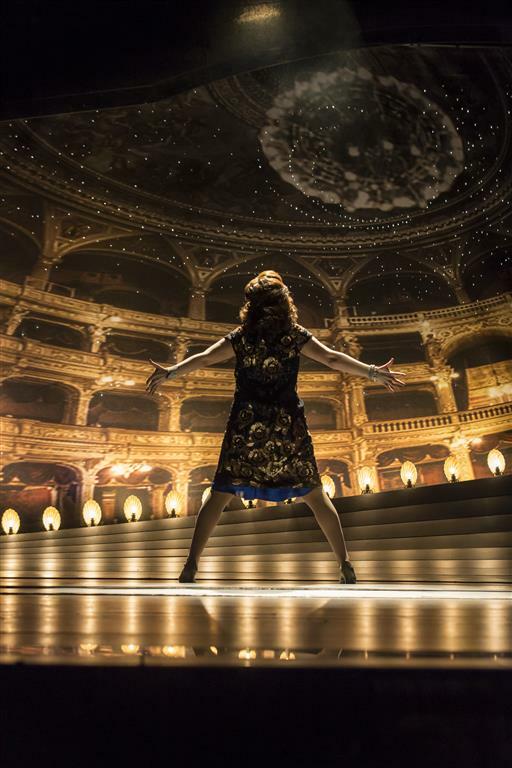 You can find more details on the theatre and official Funny Girl websites. This entry was posted in Theatre Reviews and tagged darius campbell, funny girl, natasha j barnes, nottingham, review, theatre. Darius is in it? OMG! I remember him off Pop Idol! Funny Girl is one of my fave musicals! I’m glad that the leading lady didn’t try to emulate Barbra because no-one will ever be as good as Babs! I wish it was coming closer to Hull! I’ll be so happy when our theatre re-opens, already got 5 trips booked in over the next 12 months for now! Looks like you had an amazing time! I absolutely love the theatre! And this looks as if it’s an amazing show! This looks like such a great show! !i rarely get to go to the theatre but would love to see this! I haven’t been to the theatre in ages too and seriously missing it. I saw this advertised in Wolverhampton the other day and also did the “is that THE Darius” look haha. I really want to see it after your review. I’ve never been to the theatre but this sounds like an amazing production! Sounds lovely. My family and I used to visit theatres quite often, but not so much any more, it’s something I would like to get a little bit more into!